No feet, no horse! Every horse owner knows the pains of having a horse who is off. Owning a horse is a mighty expensive proposition and not being able to enjoy your discipline with your horse because of lameness is a major problem. Your farrier is one of the most important individuals in your horse's life. The farrier can often off set problems that even the vet cannot fix. Everything from stifle, to hock, to back, to connective tissues, to navicular, to short stepping, to the endless problems that plague horses, your farrier may be able to treat by good shoeing. There is no panacea, however, a good farrier is worth his weight in gold. I cannot begin to write articles on shoeing, but I have researched a number of sites and have come up with several that will probably be able to answer most of your questions. These sites are not static. They are vibrant and provide lots of information to help you in your quest to best provide for your horse. I do not do any advertising on horsehints because I want it to be only an information site. I do not have any agenda except try to help to deliver good, solid information having to do with the horse. When I refer you to a site, I am unable to do anything about their advertising. I have tried to minimize that advertising in my selections. Hopefully these farrier web sites will be of help to you. I just want to make my own personal statement about horses and shoeing. I have found that my horses have done their best by being able to be out in paddock areas and pastures rather than confined in stalls. I have never had foot problems for any length of time. Exercise, good blood circulation, movement, a good farrier who comes every six weeks, or sooner if needed, farrier's formula, and keratex have kept my horse's feet very healthy. Both Rusty and A Patchy are barefoot on all four feet. Yes, they have good feet. Yes, we trail ride a lot. Yes, I am a believer in being as natural as possible. Of course, all this depends on many variables--your terrain, your horse's horn and foot structure, individual problems that require corrective shoeing, etc. far-ri-er: Far' -re -er/ n. var. of farrier from L ferrar (ius) smith from L ferrum iron. med. L often ferrus horseshoe. 1: one who shoes horses or a shoeing smith. 2: one who has the care of the hoof of the horse. 3: formerly, a veterinarian, esp. of farm animals. syn. blacksmith, horseshoer, farrier. Blacksmith is a general term applied to anvil-workers, most of whom do not shoe horses: horseshoer and farrier are roughly equivalent; the later denotes a higher degree of skill or training. Also see anvil, forge, pritchel, hardy, blacksmith. 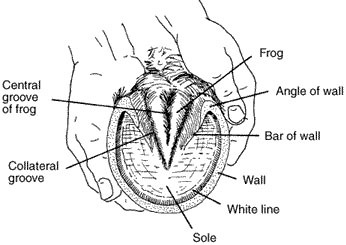 When the foot is lifted off the ground, the sole and frog are visible, as well as the bars of the wall and the collateral grooves. 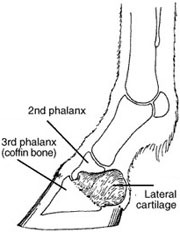 Inside the hoof, lateral cartilages extend back and up from the inner and outer sides of the third phalanx. These cartilages are flexible, but as the horse ages, they are usually ossified and replaced by bone. Between the second and third phalanges and above the deep flexor muscle tendon is a small bone called the navicular bone. 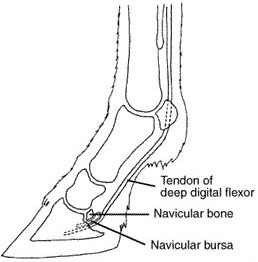 The navicular bone and its associated bursa -- a fluid-filled sac that reduces friction between the tendon and the bone -- are involved in navicular disease, which is a common cause of lameness. The digital cushion is a mass of flexible material that contributes to the formation of the heels. This structure is one of the primary shock absorbers of the foot. 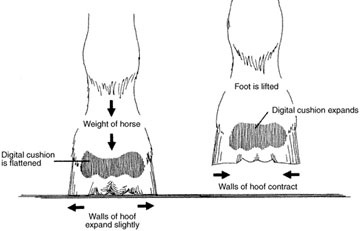 Normally, the hoof wall grows at the rate of about three-eighths inch per month. 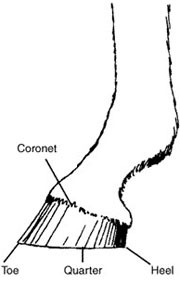 New layers of hoof wall are produced continuously from just below an area called the coronet at the junction of the skin and the hoof wall. This publication was originally written jointly by Robert C. McClure, Gerald R. Kirk and Phillip D. Garrett. Kirk and Garrett are former faculty members in the Department of Veterinary Anatomy, College of Veterinary Medicine. Illustrations are by Phillip D. Garrett.